There are a gazillion and one online storage services out there. And a few more were probably created today. Email works for sending small files, but most email providers don’t let you send attachments larger than 25MB. 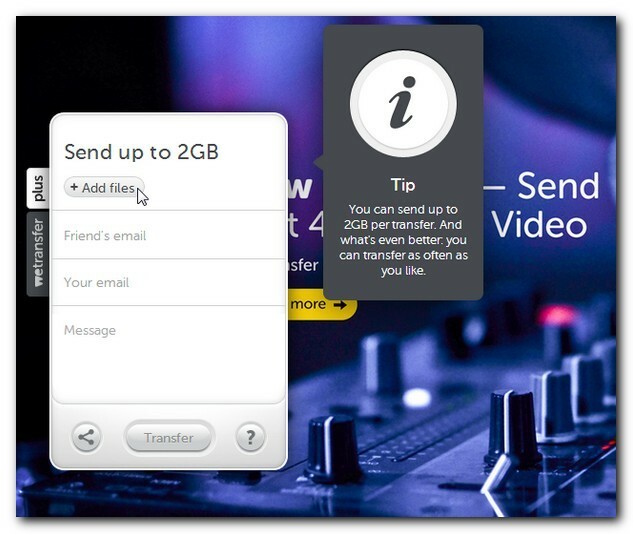 I’ve tried dozens of them, and the one I use and recommend is WeTransfer. 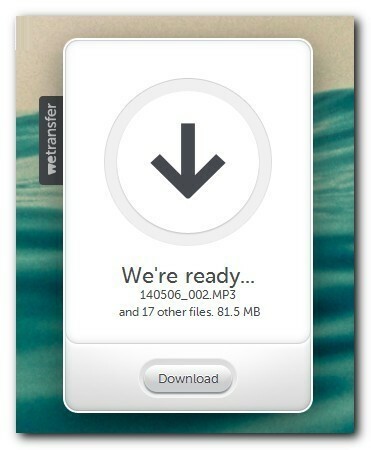 The thing I like most about WeTransfer (besides being free) is that you don’t need an account. There’s no registration or login, you just visit the site, choose your files and send them. You are allowed to send up to 2GB and your files are available for a week. You can read more about the details on their questions and answers page. Now on to a quick tutorial on how to use the service. First off, you’ll need to click ‘Skip’ on the first page. Then hit ‘I agree’ to accept their conditions on the next page. You only have to do these two steps the first time you visit the site. From then on you’re off to the races. Click the ‘Add files’ button and browse to the location of the files on your computer that you want to send. 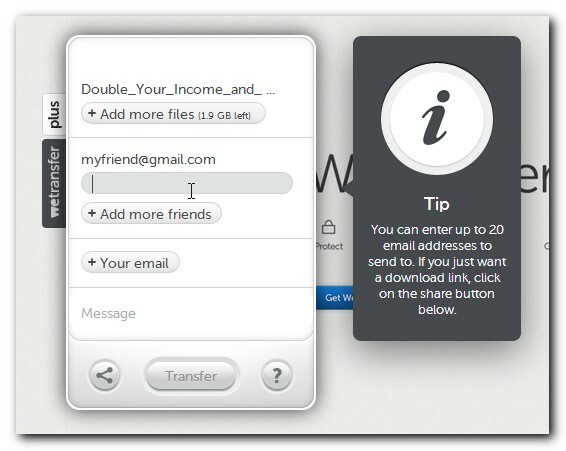 Click on the “Friend’s email” button and type in the email address of your friend. Keep clicking on ‘Add more friends’ to add up to 20 email addresses. Enter your email address by clicking on the ‘Your email’ button. This will allow them to send you a confirmation. Add a note to your friends explaining what the files are. When they click the ‘Download’ button in the email they’ll be taken to the WeTransfer web site. If it’s their first time at the site they’ll need to hit the “I Accept” button. Then they can click ‘Download’ to get the files you sent. This is a good question to ask whenever a service is free. 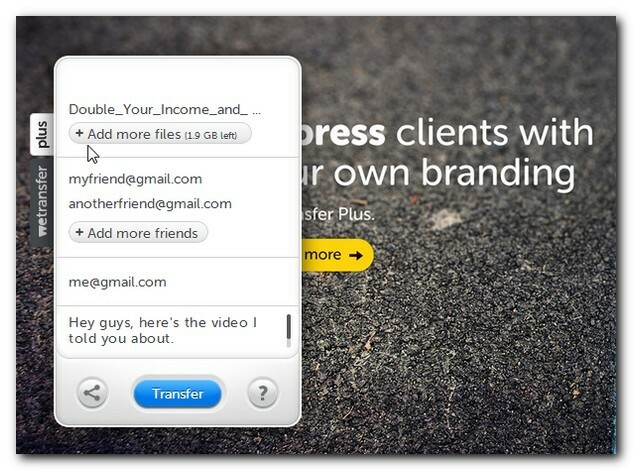 WeTransfer’s business model is two-fold. First, the wallpapers on their pages are actually advertisements. You can click on the background image to buy the illustration. 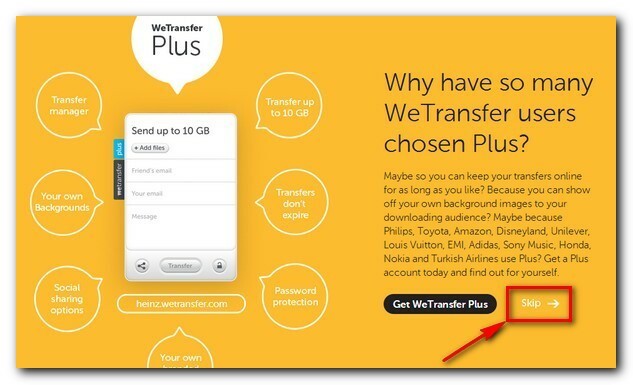 Second, there’s a paid version of their service called WeTransfer Plus. It costs $10/month, gives you a 10GB allowance, password protected downloads and a few other benefits. What are MB and GB? I’ll be covering terminology more throughly in another article, but for now, MB stands for megabytes and GB stands for gigabytes. There are 1024 megabytes in 1 GB. To give you an idea of the size of 2GB, the average MP3 music file or digital photo is around 5MB. Based on the average size, 2GB is enough to send over 400 music files or photos.